Pinterest used to be the place you’d go if you were planning a wedding or looking for dinner recipes. This has changed. With the release of Pinterest Guided Search, the product has evolved into a tool that generates sales for businesses. Created to help you actively discover content on Pinterest, Guided Search is changing the online search game. In the past we have highlighted the benefits of using Pinterest for business. Now we want to dive deeper and show you some reasons why you should care about it. We will focus on what Guided Search is, its advantages, as well as some tips on optimizing your pins. What is Pinterest guided search? Descriptive guides help you sift through all the pins, when you see something you like click on it and search adjusts and sends you in that direction. You find things through Guided Search that you probably wouldn’t have before. Because it’s fairly new still, its not crowded by the SEO gurus of marketing teams, so there is less content that is trying to hit a certain search phrase. This might help users of Guided Search get exactly what they are looking for. Use Guided Search on both the web and mobile when you are brainstorming. 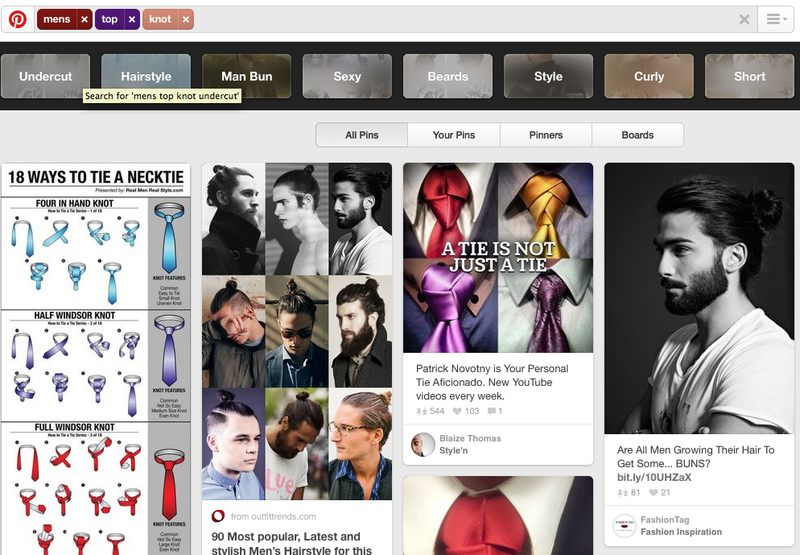 For example, if you search “men’s top knots”, Pinterest then produces several guides using terms such as “Undercut”, “Hairstyle”, “Man Bun” and others. Why should you optimize your pins for Pinterest’s guided search? Pinterest is home to over 500,000 business pages and more than 70 million users – which, in layman’s terms, is an incredible opportunity for your business. By optimizing your pins for Pinterest’s guided search, you will increase the amount of eyeballs directed towards your business and its products. According to a recent Bizrate Insights report, a whopping 30% of North American online consumers have bought a product after seeing an image on a sharing site like Pinterest. Now that you know what Guided Search is and the importance of optimizing your pins for it, here are 4 tips on how to optimize your pins for Pinterest’s Guided Search. Make sure you include your full business name, plus a keyword. This keyword should be something associated with your products and the Pin itself. Including keywords will increase the chances of your business being found while Pinners are searching for certain terms. The other thing to keep in mind is to make sure your profile is accessible by Google as well as other search engines. Go to your profile settings page and set the “Search Privacy” option to “No.” With Google being one of the first places people go to for answers, make sure your profile is searchable, so you can answer people’s queries with your pins. As with all quality content, make sure your descriptions are useful to keyword searches but also valuable to your audience. Put yourself in your customers’ shoes, and think about what keywords they would search. For example if you sell those ever-fashionable multipurpose shoes called Crocs, the keywords you could use are “shoes,” “beach shoes,” “chef shoes,” “comfortable,” “fashion,” “kids shoes,” etc. Include what makes your business unique, essentially reasons why consumers should care about your product, as well as some sort of call to action—whether it’s to follow you, contact you or sign up for a newsletter. According to BrandonGaille, pins with CTAs actually have an 80% increase in engagement over pins without CTAs. As with all great marketing strategies, in order to increase follower counts and engagement, consistency is key. Pinning on a consistent basis as well as at times that you know your audience is browsing, will increase your discoverability as well as reach both a local and global audience. There is a ton of noise out there online. The thing that Pinterest Guided Search gets right is that they understand that often when people surf the web, they are looking to get inspired, not bored. This means that when you search for something on Pinterest, you don’t arrive at one obvious conclusion—rather, it gives you a plethora of different but all equally interesting answers. In the end, Pinterest leaves you inspired and full of more ideas then you would have had with just an Q&A search. Social media management is made easy with Hootsuite Pro. Try it for free for 30 days!